Electronic Arts came under heavy fire this week from fans upset about planned microtransactions in Star Wars Battlefront II. Thousands of people flooded social media to criticize how hard it was to unlock in-game content without spending real-world money, and it looks like the video game publisher has taken the criticism to heart. 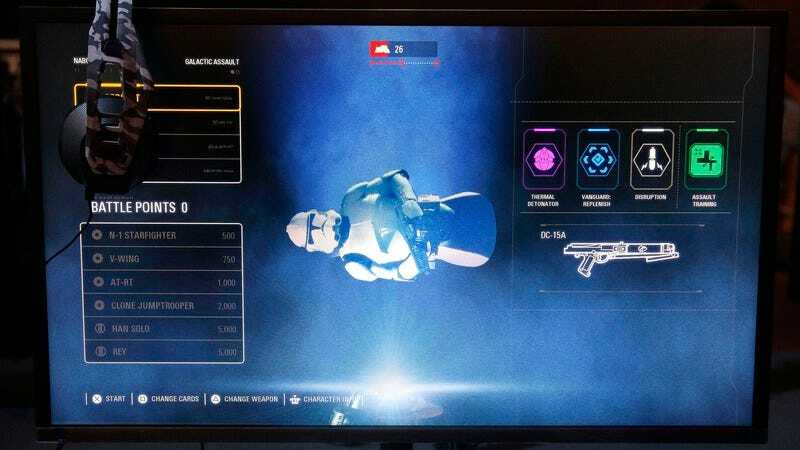 Today EA switched gears and announced that all characters will be immediately available without legs, and that you’ll eventually be able to unlock their legs for free. This is great news for gamers who want to eventually walk or run in Star Wars Battlefront II without spending more than the initial $60 price tag. The fan response to EA’s apology has been positive overall, but some people are still complaining that the game can be punishingly difficult before you unlock legs for your characters and they are still flopping facedown on the ground. While using a hero like legless Boba Fett, it’s nearly impossible to squirm forward while holding a blaster in one hand, forcing players to choose between moving or shooting. Legless characters also are unable to navigate up or down stairs, and immediately drown when playing on the swamps of Dagobah map. There may still be a few kinks to iron out in Star Wars Battlefront II, but it seems that EA is committed to accepting feedback and improving the game until fans are satisfied. EA hasn’t ruled out selling legs for real-world money in the future but promises to make sure that non-paying players can always get legs for free if they put in the work. If you were boycotting the game before to protest its excessive microtransactions, now there’s no reason not to buy it and start your exciting adventure wriggling on the ground in a galaxy far, far away.